The box office for Robinson Performance Hall is located on street level and open Monday through Friday 9:30 AM – 5:30 PM. Tickets for Arkansas Symphony Orchestra (501-666-1761) performances are sold directly through ASO. 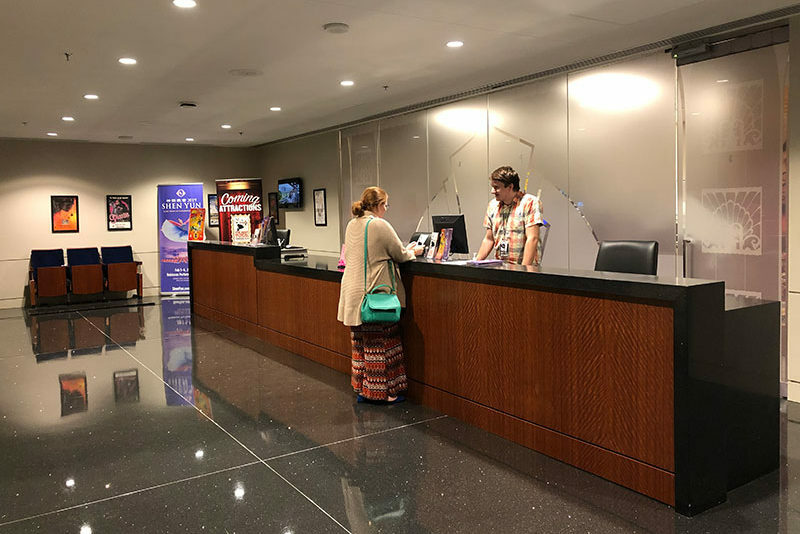 Celebrity Attractions (501-244-8800) operates the box office in Robinson Performance Hall for all ticketed events, utilizing Ticketmaster software. ASO and Celebrity Attractions are the only two official ticket retailers for Robinson Performance Hall events. Beware of other fraudulent ticket websites. Robinson Center offers self-parking in the Robinson Parking Garage, attached to the center. The entrance to the parking garage is located at Markham & Spring Streets and off of La Harpe Boulevard on the North side of the Robinson Center/DoubleTree Hotel complex. There is an ATM located in the box office area. Robinson Center does not allow smoking of any kind, including the use of e-cigarettes or vaporizers inside the facility or within 25 feet of all entrances. Basic first aid supplies may be obtained from the Security office located on the street level lobby. Any volunteer, or Robinson staff member, may also access these supplies. Please note, the Robinson Center cannot provide medication. The safety and security of our guests and staff is of utmost importance. Robinson Center does not permit firearms or other weapons (knives, tasers, mace, etc. ), of any kind in the building. Assisted Listening Devices (Infrared ALD) are available at the receptionist desk in the street level lobby. There is no charge for the device, but a government issued ID is required to be held until the device is returned. Small bags (no larger than 14” x 14” x 6”) and purses are permitted. Backpacks are prohibited. An exception will be made for medically necessary items after proper inspection. All bags are subject to search. No professional cameras (cameras with detachable lens) and/or recording devices will be permitted inside the Performance Hall. Please note: many shows do not allow photography. Please be respectful of this policy. The lobbies for the performance hall open 90 minutes prior to the start of the performance. The doors inside the hall will open approximately 30 minutes prior to the curtain. Ticket holders should plan to arrive at least 30 minutes before the scheduled performance time. Robinson Center provides multiple drop off areas for patrons: West side of the building, off Broadway Street; East side of the building, off the hotel driveway; and at the base of the grand columns on Markham Street. Permission for late seating is determined by each performance. In most cases, it is permitted, however you may be held in the lobby until an appropriate entrance time. For most performances, you are permitted to leave and return to the performance hall. Before exiting please check with a ticket taker or usher. For shows requiring tickets, all persons regardless of age must have a ticket to enter unless a special promotion provides for free entry. Generally, the performances in the Robinson Performance Hall will go on as scheduled regardless of inclement weather, and no refunds will be issued. However, in the unlikely event the promoter cancels a performance refunds will be issued by the promoter. Walk-through magnetometers are mandatory for every ticketed, live performance event at Robinson Center, Statehouse Convention Center and First Security Amphitheater. All patrons will be scanned. Expectant mothers and those with pacemakers will be screened with handheld devices. • Any other item that may be deemed by event organizers and/or staff as a potential safety or security threat.